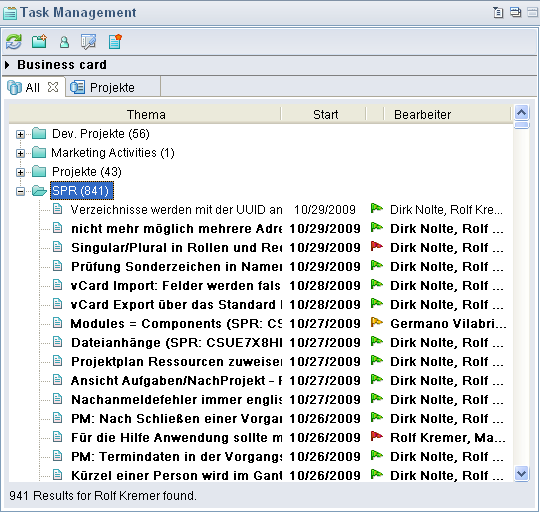 The last weeks we made three updates of the > Task Management project on > OpenNTF.org. First, we improved the view of all tasks with an explorer interface (see the image below.) Second, we updated the interfaces which will be delivered by default. Now, interfaces to the Lotus Notes Mail applications in Release 6, Release 7, Release 8 and Release 8.5 exists. Further, we added interfaces to TeamRoom applications delivered with Lotus Notes/Domino Release 6, Release 7, Release 8 and Release 8.5. Third, we updated the JavaDoc documentation of the project. I added a presentation >’Task Management for OpenNTF on SlideShare, which is based on our > DNUG presentation in Fulda on 17th November.